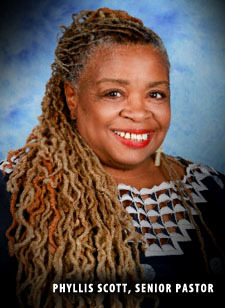 Pastor Phyllis Scott founded “Tree of Life Empowerment Ministries” in 2004. The ministry started as a small Bible study and quickly grew into a much larger, closely knit church family. Pastor Scott has an insatiable desire to help others through teaching and ministering the powerful word of God. In addition to founding the church, she is the founder of “Exodus”, a teen prostitution recovery ministry and “The Empowerment Enrichment Academy”, a spiritual and personal wellness development program based on biblical studies. The academy is designed to bring students into a clearer understanding of the Bible and to develop them spiritually. Pastor Scott is a firm believer in continuing education. Pastor Scott attended Patten University located in Oakland, CA and majored in Pastoral Counseling. She attended the Sacramento Theological Seminary where she completed her studies in Divinity. She is an accredited Christian Counselor and is certified through “American Christian Counselors”. She feels that of all she may have accomplished, the most important accomplishment and the one she hopes will matter in the end, is that she loves the Lord and will serve him all the days of her life. For in the end it is not the degrees on the wall or the universities that you may have attended that matter. Those are things of the world and the world is passing away along with its desires. Those that do the work of the Lord will last. It is only what you do for Christ that will last. Pastor Scott officially became an Oakland Chaplain on March 1, 2010. She along with members of the Pastors of Oakland Council will be first responders to Oakland crime scenes to offer spiritual guidance and support to victims of crime. Pastor Scott is a firm believer in the healing power of God. His power can give hope even when situations seem hopeless. Pastor Scott is an active member in her community and our prayers are with her as she begins this new endeavor.